Several Lenin monuments were damaged in Odesa oblast this weekend. A monument to Lenin was destroyed on Saturday morning in the town of Savran. Another one was torn down in the town of Liubashovka. 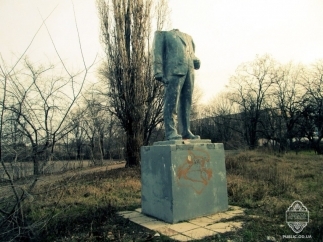 The following morning, a bust of Lenin was destroyed in Bilhorod-Dnistrovskyi. On Sunday, [in the Museum of totalitarian sculpture] in Odesa’s Lenin Komsomol park, one Lenin monument was covered with red paint and another decapitated. “This is vandalism. They could have taken down and damaged all thirty-seven monuments of Odesa oblast, having no idea what communists did for the region,” said the leader of the local Communist organization. Euromaidan in Kharkiv: protests continue.